Aisling McCarthy will be staying on with the Bulldogs for the 2020 season. TIPPERARY STAR AISLING McCarthy has signed a new one-year deal for the Western Bulldogs club following an impressive debut season in the Australian Women’s Football League (AFLW). 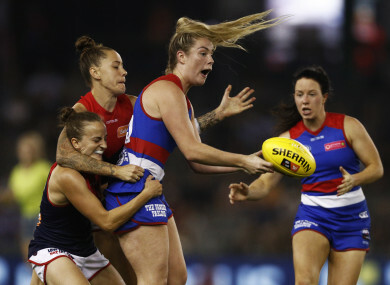 McCarthy kicked five goals and collected 61 disposals in six appearances for the Bulldogs this season, as she joins a list of 13 players who have committed to the club again for 2020. “I really enjoyed my first year with the Bulldogs,” the Tipperary footballer told Bulldogs Media. The Bulldogs finished at the bottom of Conference A in the AFLW ladder this year with five defeats and two losses. McCarthy was picked up by the club in the 2018 draft after impressing at the Cross Coders international camp in Melbourne. She travelled over as part of a group of 18 athletes in the hope of securing a deal with an AFLW side. Along with McCarthy, Clare’s Ailish Considine, Donegal star Yvonne Bonner and Sarah Rowe of Mayo were also successful. Considine signed for eventual AFLW champions Adelaide Crows, with Bonner joining Cora Staunton at Greater Western Sydney (GWS) Giants while Rowe linked up with Collingwood. The Mayo star forward also looks set to stay on with Collingwood next season as she awaits for the new deal to be rubber-stamped. Speaking to The42 earlier this week, she said balancing her Aussie Rules and inter-county commitments could be tricky next season. Email “Tipperary star re-signs for Western Bulldogs after impressive debut season”. Feedback on “Tipperary star re-signs for Western Bulldogs after impressive debut season”.